Julian de Miskey was born in Hungary and emigrated to the United States in 1914. He attended school in Ohio and in 1917 moved to New York, where he studied at the Art Students League. The following year he began contributing to such magazines as Forbes and the Saturday Evening Post. De Miskey also illustrated and designed covers for a number of books, including Chucaro: Wild Pony of the Pampa, The Prophesies of Nostradamus, The Trouble with Jenny’s Ear, The Great Pearl Secret, Tim’s Mountain, and Piccolo, a children’s book which he both wrote and illustrated. In addition to his work as an illustrator, de Miskey studied sculpture and created stage sets and costume design. 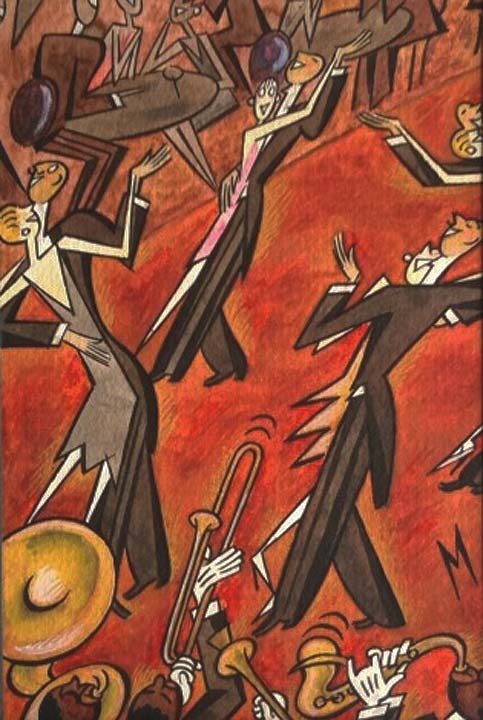 De Miskey worked in a number of different styles including expressionist, non-objective, and cubist-futurist, though his commercial work was more traditional. His sense of humor came across in his work The New Yorker magazine. Writing in the magazine’s December 15, 1997 issue, Lee Lorenz, the New Yorker art editor from 1973-1993 and subsequently its cartoon editor, noted: “Julian de Miskey, the artist who signed his work M, was one of the most prolific and resourceful of the first wave of New Yorker artists. He did spots, cartoon, and covers, and helped create the decorative style of The Talk of the Town…” De Miskey created a total of 62 New Yorker covers, and many cover concepts. De Miskey was a member of the Whitney Studio Club in Manhattan during the 1930's, along with Edward Hopper, Guy Pene du Bois, Mabel Dwight and Leon Kroll. He was also a member of the Woodstock Art Association.